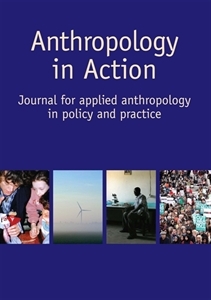 Anthropology in Action is a peer-reviewed journal publishing key articles, commentaries, research reports, and book reviews that deal with the use of anthropology in all areas of policy and practice. The journal provides a forum for debate and analysis of anthropological themes. Recent themes have included identity and movement, anthropology in Denmark, the effects of ethics, and anthropology and activism. Subjects covered by the journal include organisations, HIV/AIDS research, new reproductive technologies, the rights of indigenous peoples, community care and social policy, health, medicine and suffering, education and government policy, museums, place and space, management, ethnicity and violence, and overseas development. Membership benefits of AAIA includes a print subscription with online access toAnthropology in Action. Once you've renewed your membership below, issues will be mailed to you as they release; for full online access to current and back issues activate your access after you have renewed (please allow 10 days for processing).